One of the main draws to central Newfoundland & Labrador each winter is to enjoy the ever expanding network of snowmobile trails in the region. The RiverWood inn is ideally located on a trail bed with easy access to the groomed trails maintained by the Green Bay Snowmobile Council and only minutes away from community services. 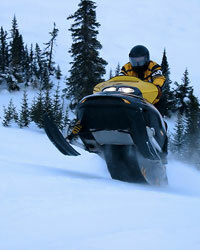 For further information on the trail network please visit http://www.nlsf.org/maps.html for an island-wide nap of trails or check out the Green Bay Snowmobile Association's website at http://www.greenbaysnowmobile.com/. The RiverWood inn offers special group rates and packages for the avid snowmobilers so when planning your next trip call us for details on "the ultimate snowmobiler's getaway". For those of you who prefer more natural ways of exploring winter on snowshoe or x-country skis feel free to drop us a line for a description of local conditions and maybe we'll entice you to stay a night in our luxurious inn and we'll even throw in a gourmet lunch of hot tea, fruit cake, and speciality sandwiches.